We offer Label With Holographic QR Code which are holographic labels with patent pending Holographic QR that are printed. 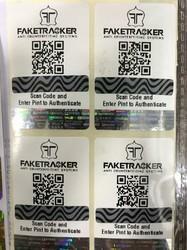 These QR codes and labels can be verified on different devices such as smart phone / tabs / browser. With our Label With QR Holographic Code, we are providing highest enforceable security to our customers. Looking for QR Code with Holograms ?